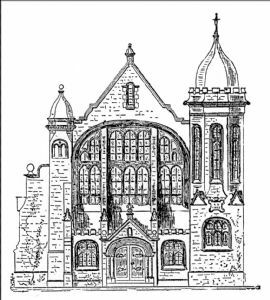 Cowley Road Methodist Church, Oxford was originally called Wesley Hall. The design of the church exterior by the architect Stephen Salter, was influenced by the 'arts and crafts' movement of the time. The asymmetric plan was very unusual. In 1972, the exterior of the church became Grade II listed. The church first opened its doors for worship in September 1904. It was built to accommodate a rapidly developing congregation which had met at a chapel in <?xml:namespace prefix = st1 ns = "urn:schemas-microsoft-com:office:smarttags" />Tyndale Road for the previous 20 years. The church owes its formation to this group of Christians, led and inspired by Walter Slaughter, a local grocer. A memorial tablet to Mr Slaughter still hangs in the church today, as does a tablet in honour of twenty-one men associated with the church who died in World War I. In recent decades, the church has welcomed those who have come to East Oxford from overseas. In 1967, a service in Punjabi was introduced, which continues to this day. In 1984, the church was redeveloped and refurbished, with a multi-purpose worship area introduced upstairs and several meeting rooms downstairs. The Church Centre was designed to be of maximum benefit to the community in East Oxford.